Home > Football > World Cup Final Preview: Will Germany Become the First European Side to Win in South America? Arch-rivals Germany and Argentina meet in the finals for a third time, renewing a rivalry which spans three decades when they first clashed in the 1986 finals in Mexico and again in Rome four years later. On Sunday, the two sides meet each other for a third successive World Cup dating back to Berlin. Germany has won the last three encounters, both of which were quarter-finals. In 2006, Germans defeated Argentina on penalties in a game marred by a post-match melee. In South Africa, the Germans again sent the Argentines packing with a 4-0 drubbing which saw former coach Diego Maradona resign. Many of the players are back for a second act and even third act. Lionel Messi will once again lead his squad against a strong Germany team lead by the usual suspects, Philip Lahm, Bastian Schweinsteiger, and half a dozen returnees from South Africa in 2010. Messi has one last chance to stamp his mark on this World Cup, much like Diego Maradona did in 1986, with a defining performance in Sunday’s final. Messi showed moments of brilliance in the group stage with four goals, but he has been kept in check during the knock-out stage by opponents hell-bent on curbing his influence through air-tight man marking. Argentina came into the tournament with question marks about their defence, but under coach Alejandro Sabella, Argentina have proved their critics wrong with stifling defensive displays that shutdown their opponents and left fans yawning in front of television sets. The semi-finals showed the contrasts in style. The Argentina defeat of the Dutch mirrored two heavyweight boxers going toe-to-toe for twelve rounds without landing a single punch on the opponent for fear of being hit back. Germany goes into the final riding a wave of confidence, after having knocked out host Brazil with a humiliating 7-1 scoreline that left fans in the soccer hotbed in shock. Germany Coach Jogi Loew looks to have found a winning combination of player selection and tactics that have seen the Germans comfortably outplay their opponents since the extra time period against Algeria, whence Germany have outscored the opposition 10-2. Loew is still regarded as a coach who hasn’t won the big game and who tends to out-coach himself by over-thinking player selection and tactics, typified by the semi-finals loss to Italy in the European Cup in 2012. Sunday, however, will offer no surprises as Loew is unlikely to make any changes to the lineup that shutdown France and made Brazil look like schoolboys. The final also marks the end of the road for a generation of players who have yet to win a major competition. These include Philip Lahm, Bastian Schweinsteiger, Miroslav Klose, Lukas Podolski, and Per Mertesacker. The semi-finals have raised many questions: How will Germany respond to a strong, organized Argentine defence? 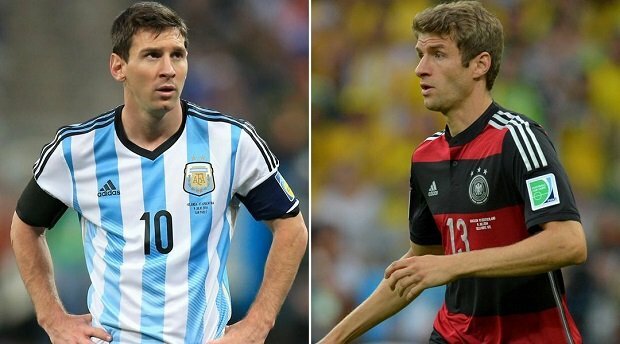 Will Argentina be able to handle high-pressing German team that looks to score? What to expect from Argentina? Argentina will employ the same negative game plan they did in their defeat over Holland. “Organization” will be the word of the day, as the back four and midfield trio stay close together and move up and down as a single unit. In this way, Sabella will look to close down the German attack by limiting space and time in his own half. While this tactic effectively neutralized the high-flying Arjen Robben, the sole creator in the Dutch squad, it’s questionable whether it’ll have the same impact on the Germans who attack more as a unit. Mesut Özil on the left flank offers creativity and pace, Sami Khedira and Toni Kroos will be looking to finish chances from inside the 18 yard box, while Thomas Mueller lurks in the foreground. Argentina’s scoring chances will come by the way of quick counter-attacks against the Germans when they concede possession in the middle of the pitch. However, expect little to no attacking thrust for major patches of the game, as the Argentines gladly sit back and look to pounce on a turnover. The danger in this approach is that Argentina’s three forwards, Messi, Angel Di Maria, and Gonzalo Higuain, may become isolated up top if the midfield sits too far back, which it will, meaning they have little influence for long stretches. Moreover, without a healthy Di Maria, it’s hard to imagine where Argentina will generate offence if the Germans double team Messi. Look for Messi to drop team or push out wide if he’s not finding the space in the final third. While this will allow more touches on the ball, it will also negate his influence as he’ll be further from the German goal. Sabella plays three midfielders deep, just ahead of the four-man back line. Painful to watch, this tactic has proved highly effective as Argentina have racked up a series of dull 1-0 wins and have not conceded a single goal in six hours of tournament play. Who can argue with success, right? Overall, the squad looks highly organized in midfield and relies on moments of magic from Messi. The game plan will be the same as in the semi-final, where a conservative approach rarely saw them venture forward against the Dutch. What to expect from Germany? Coach Loew has opted for a more cautious, tactical approach this tournament, although the scoreline hasn’t always indicated such, playing Kroos, Khedira, and Schweinsteiger in midfield, with the latter in a deep-lying role ahead of the central defenders. This Germany waits for their opponents to make a mistake and then presses forward as unit. This style is in marked contrast to what we saw in South Africa where Loew’s boys played a run and gun style, taking the initiative in attack but often leaving themselves exposed at the back. Germany will continue with a high defensive line, an approach that looks more sound now that Jogi Loew has inserted the speedier Jerome Boateng as Hummels’ partner in the middle of defence. The high line congests midfield making it difficult for attackers to find the time and space to operate. It also means the Germans will force turnovers further up the pitch, allowing for quick counters with less than 50 yards to the Argentine goal. For Germany, Khedira and Kroos will be key factors in the outcome of this match, and there is every indication that these two players have peaked ahead of the final. Against Brazil, Khedira was dominant, pressing the midfield and forcing turnovers, while Kroos moved forward in stealth-like fashion to convert his scoring chances from inside the box. Lovers of a stereotype will note that Germany are the best all-around team at this World Cup. Thomas Mueller is a typical example, a forward who has been as enthusiastic in attack as he has been in tracking back to help in defence. The attacking trio of Mueller, Klose and Oezil are uncharacteristically unselfish for a group of forwards, which means more ball movement in the attacking third with midfielders playing an active part in creating and converting scoring opportunities. With experience on their side, the Germans will be confident that their team spirit, strength in midfield, and high defensive line will be enough to blunt Messi and thwart the Argentina attack. Apart from Kroos, Hummels, and Benedikt Hoewedes, the remaining eight starters for Germany are all returnees from the quarter-final clash against Argentina four years ago. Compounding worries for the South Argentines will be how ruthless Germany have been on set-pieces, having already scored four times this tournament. If the Argentines strike first, they’ll bunker down and employ a stifling defence to keep the Germans off the score sheet. Germany, however, will find a way back into the match. If the Germans score first, and fans should be cheering for this, expect the game to open up as Argentina will be forced to attack leaving themselves vulnerable at the back. Germany like nothing better than to go after wounded prey. Germany will carry the day as their overall quality will be too strong for an Argentina squad that plays a negative brand of football and relies too heavily on one individual.